Morocco is a country of rugged peaks and endless trails. The highest peaks in this North African state, which is dominated by the Rif mountain range in the north and Sahara Desert in the south, promise some of the world’s most spectacular views, making the hard work to get there more than worth it. Towering over the Atlas Mountains in southwestern Morocco, Mount Toubkal is the highest mountain in the country, standing at 4,167 metres tall. 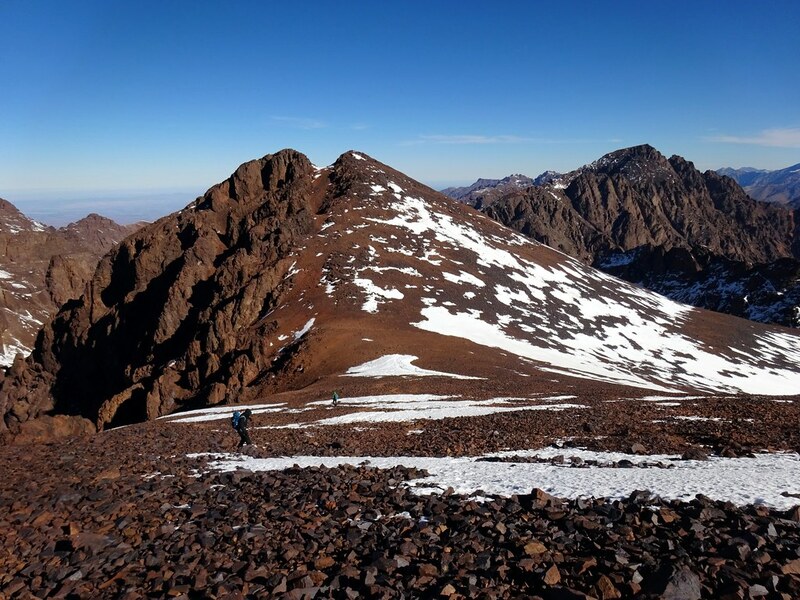 Toubkal is the tallest mountain in the Arab world and as an ultra-prominent peak (over 1,500 metres) it is one of the most exhilarating in the world. Hikers usually base themselves in Marrakech, Morocco’s second city, which is only 63km north of the mountain. 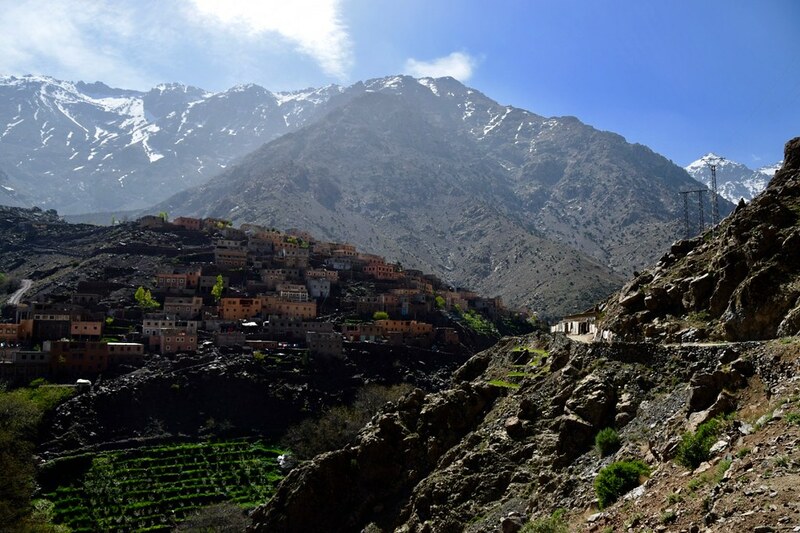 Toubkal is approached from the village of Imlil, from where optional guides and porters can be hired. Hikers start off easy, walking through the picturesque village of Aroumd, east across a floodplain to the tiny settlement of Sidi Chamarouch, before continuing up the gradual gradient to basecamp at either Neltner Refuge or Refuge du Toubkal. As the rocky path continues up the mountain, the altitude drops and in winter, snow and ice fields coat the mountain, with the option to ski part way down on the descent. Jebel Yagour is to be found in the High Atlas mountain range near Marrakech. The high plateau stands at 2,700 metres high and it is surrounded by sheer cliffs and steep slopes, making this a real test of endurance for those willing to attempt the trek into the clouds above Morocco. 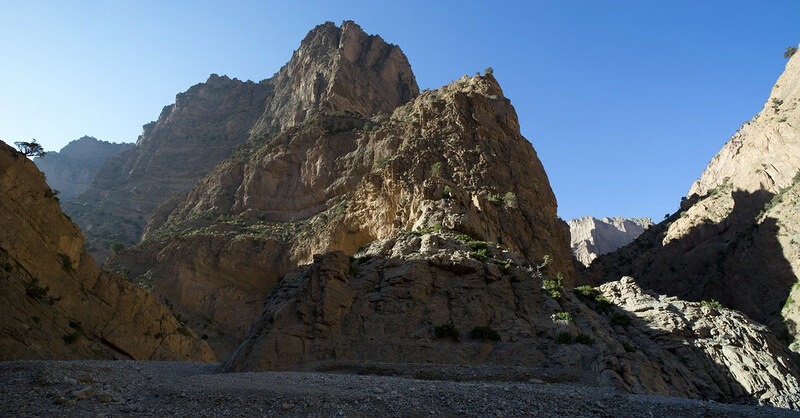 Not only are the natural surroundings of Jebel Yagour spectacular, with different views across the country around every turn, the mountain is also famous for hundreds of rock and cave paintings thought to date back to 1,000 BC. documenting the history of this region. As you follow the dusty trail from the base of the mountain, you will literally be following in the footsteps of thousands of traders trekking across the mountains to the bustling souqs in the north. As with all hikes in this part of Morocco, Marrakech is the perfect base from which to prepare. Standing at 3,729 metres tall, the high peak of the Ouaougoulzat mountain is in the Mgoun Range (named after the Mgoun Mountain) and it leads to the Lac Izoughar ski slopes in the winter months. There are a number of locally-operated gites at the base of Ouaougoulzat close to the ski slopes. In the spring and summer, the reflections of the towering mountains in a lake at 2,526 metres above sea level are unforgettable. From the base at Lac Izoughar, it takes around 5 hours to climb to the peak of the mountain, with some steep parts coated in a powdery dust. Mules and guides can be hired from Bou Guemez road in the town of Azilal at the base of Ouaougoulzat, but from here the hike is extended to two days. Wherever you choose to start this hike, the views across the triple snow-capped peaks of the Mgoun Range are unrivalled. This is one of the most demanding peaks to hike to, with some Alpine experience recommended before attempting to scale the twin peaks of Ouanoukrim Mountain. At its highest point at 4,089 metres above the Atlas Mountain Range, the mountain spans two summits, Timzguida (4,089 metres high) and Ras Ouanoukrim (4,083 metres high). This mountain is a seemingly endless chain of brown dust-coated crags and crevices waiting to be discovered. The views from the peaks are of a field of cliffs and spectacular reflections of the sun in the steamy mists that rise up from this part of Morocco. Much Better Adventures can organise a stay with a local host who can guide you along the treacherous routes up Ouanoukrim. Mount Tidirhine (locally known as Jbel Tidirhine) is in the Al Hoceima Province of Morocco, in Tanger-Tetouan-Al Hoceima in the north of Morocco. With an elevation of 2,456 metres high, this is the highest of the Rif mountains and home to many traditional Berber villages that have been here for centuries. Another of Morocco’s ultra-prominent peaks, most people start their hikes up the mountain from the Moroccan capital of Rabat. As the hiking trail rises, the mountain promises views out across the Strait of Gibraltar and, on a clear day, it is possible to see the shores of Spain. This is a great entry hike for adventurers looking to experience Morocco’s peaks. 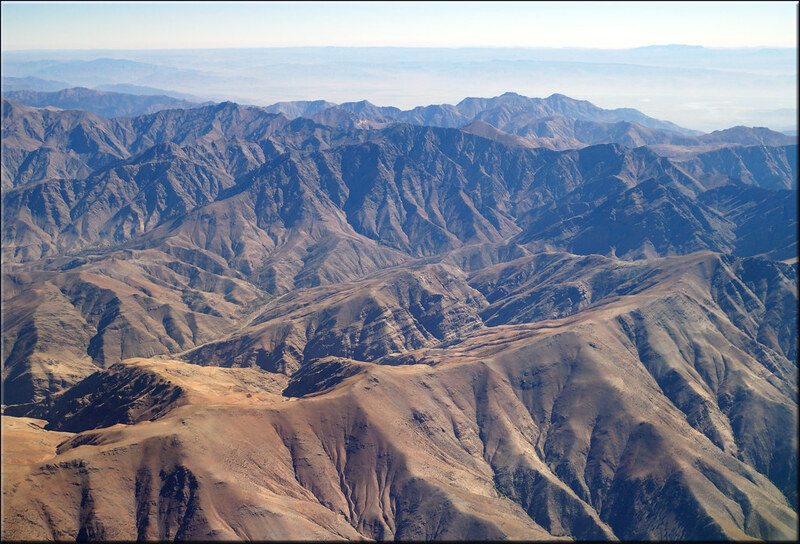 One of the highest mountains in North Africa, and the anchor mountain for the Eastern High Atlas in central Morocco. Jebel Ayachi rises to a height of 3,757 metres and is home to countless rare and magnificent birdlife. The mountain actually forms a ring around the town of Midelt, creating spectacular photo opportunities. 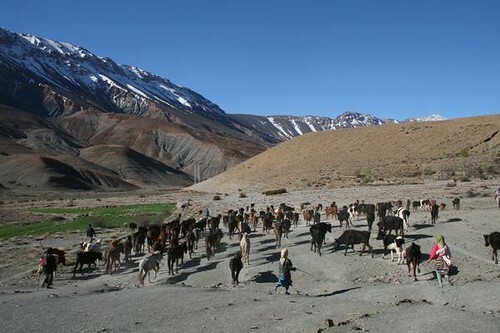 Despite being close to the Sahara Desert, the mountain peaks retain their snow coating late into the summer, and nomadic Berbers have raised livestock across Jbel Avachi for thousands of years, continuing today. There are countless ravines crossing the mountain, supplying fresh mountain water for those refreshing bathes after a strenuous hike. The M’Goun Valley is perhaps the most popular trekking route in Morocco, and it takes around 5 days to successfully reach the peak of this High Atlas mountainous valley. Rickety wooden bridges barely support hikers as they climb over fast-flowing rivers flowing down sheer cliffs, hiking tracks are engulfed by landslides, and donkeys roam freely across the mountain ridges. When you reach the towering peak, the views of brown and grey mountains, patches of verdant green grass, and murky rivers and streams leaves a lasting picture like no other. Discover Morocco with our hand-crafted trips to the Atlas Mountains, Summit Mount Toubkal and other Moroccan adventures.